Sometimes you need an answer right away. While we love to hear from you, and are happy to answer any question you might have, we&apos;ve compiled this list of our most frequently asked questions so you can get your answer sooner than later. The FAQ is organized into questions for Visitors and for Individuals. If you don&apos;t find an answer to your question, feel free to contact us. Our most asked questions or requests from people planning a visit to Salt Lake. Will you send me information, guides, or maps about Salt Lake for our Trip/Vacation? The Salt Lake Visitors Guide includes details, maps, and more specific for visitors to our area. For the fastest service in receiving the Salt Lake Visitors Guide you can view it online or request it through our online form. If there is a specific item or information you need, please request help through our regular contact form. Please be as specific as you can so our specialists can help you better. Where can I find more information about visiting the National Parks in Utah? Salt Lake is a great place to begin your visit to National Parks, Recreation Areas, State Parks, or wilderness areas. You can find more information about State and National parks on our site, on the US Park Service site, or on the Utah State Parks site. I have questions about or am having problems with my Connect Pass or Super Pass. Can you help me? We have FAQs specific to the Visit Salt Lake Connect Pass and Ski Salt Lake Super Pass. If you need immediate assistance, please call our Visitor Information Specialists to contact us online. What events will be happening when I am in town? Visit Salt Lake is partners with NowPlayingUtah.com, a comprehensive calendar of events for things that are happening in Salt Lake and across Utah. You can do a simple search for Salt Lake events here or visit NowPlayingUtah.com to browse what&apos;s going on across the state. I would like to go on a guided tour of Salt Lake. Do you have any recommendations? Yes! You can find the members of Visit Salt Lake that provide guided tours here. Can I float in the Great Salt Lake? Where? Antelope Island State Park is a short drive to the North on I-15. There you will find improved beaches and showers at Bridger Bay. The lake is so salty that you will float like a cork! Can you provide me with a list of dining and activities in Salt Lake? Our website has a very useful array of search tools to help you plan your Salt Lake vacation. You&apos;ll find search tools for dining, attractions, arts, shopping, recreation, and national parks at these links. If you need further assistance, just let us know. What will the weather be like when I am in Salt Lake? Salt Lake has four distinct seasons, with weather that varies widely across those seasons. Check out this overview of the weather in Salt Lake for more details. When does the ski season start/end? The ski season typically starts in November, with the Ski Salt Lake resorts usually open for Thanksgiving weekend. Conditions normally permit skiing into mid-April, with unusually snowy years providing opportunities for skiing into July. Check out the snow report for opening/closing dates and snow conditions at the resorts. I would like to see a Mormon Tabernacle Choir performance. When can I do that? Do I need tickets? There are generally two opportunities per week to see and hear the choir. Thursday evenings and Sunday mornings. Please visit the choir website for locations, times, and special performances. What is your public transportation system like? Can I get to and from where I need to go using only public transportation? Questions about employment, group planning, school projects, etc. I am considering relocating to the Salt Lake area. Can you send me some relocation information? We do not provide printed relocation information or packets, but some of our members do. If you would like to request a Visitors Guide, please fill out this form. 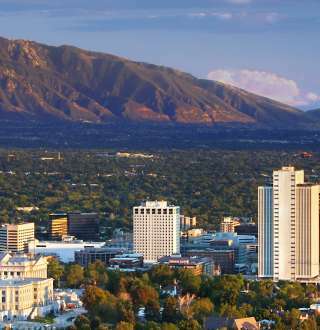 For more information on relocating to Salt Lake, please visit the Salt Lake Chamber of Commerce. Can you please send me information on my genealogy? Unfortunately, we are not a genealogy research service and cannot provide you with specific research on your ancestors. You can find more details about the genealogy services available in Salt Lake from the Family History Library. I am doing a report on Salt Lake, Utah, or The West. Can you send me free postcards, maps, etc? If you are looking for information, you will find it here on our site or on visitutah.com and utah.gov. We do not have free postcards. The Salt Lake Visitors Guide includes maps and information about the Salt Lake area. You can view it online or request one through our online form (be sure to include a valid address). Where can I find information about employment, internships, or volunteer opportunities? The SLCVB posts employment opportunities on our site. If you do not see something that you are interested in, or are looking for an internship, please contact the Director of Human Resources with details on your qualifications and availability. If you are interested in volunteering, please fill out this form or contact the Director of Hospitality & Visitor Services. I am planning for a convention, wedding, reunion, or large group. Do you have help for planning these things? Yes. Our goal is to have your group come to Salt Lake, so we&apos;ve designed tools to help you find venues, sports facilities and hotels to fit your needs. You will find these tools and much more in the Meetings and Group Tour sections of this site. If you have specific questions, please submit your question, with as many details as you can, on our contact form and our Visitor Services team will forward your question to the correct department.